Volcano cakes are appropriate for luau-themed parties as well as prehistoric-themed parties. Making a volcano cake starts by building a cone-shaped cake. Then, choose from one of three methods to replicate the volcano erupting. 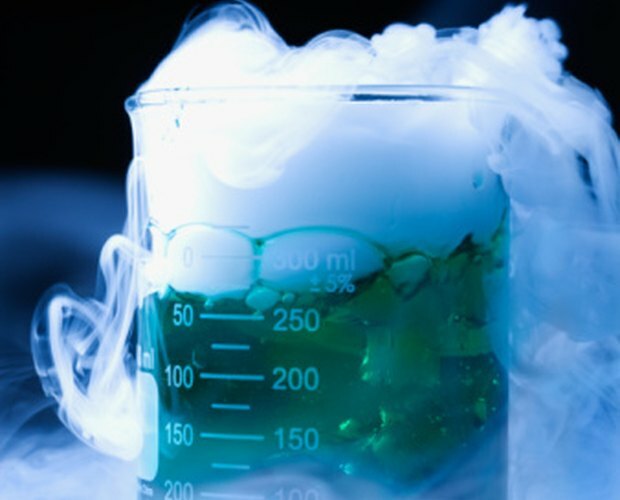 Although dry ice will achieve realistic smoke, if you want to avoid using dry ice, choose from poured candy, frosting or a mixture of baking soda and vinegar. Prepare two dome-shaped cakes by baking a cake mix in a Bundt cake pan, one in a 10-inch pan and one in a 7-inch pan. (You will need about three boxes of cake mix.) Bake according to package directions. Allow the cakes to cool completely on a cooling rack. Stack the two cakes on top of one another, starting with the smaller cake on top of the larger cake. Stack them so the flat sides are down and the rounded sides are up. Use a serrated knife to carve the edges of the two cakes to create a cone shape. Cut a 3-inch circle in the top of the smaller cake that is 3 inches deep. Frost the outside of the cakes with brown frosting to create the volcano. Cover two cookie sheets with aluminum foil. 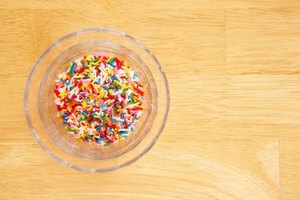 Mix together 1 cup sugar, 1/2 cup light corn syrup and 1/4 cup water in a medium saucepan. Bring the mixture to a boil. Monitor the temperature on a candy thermometer until it reaches 295 degrees Fahrenheit. Turn the heat off. Add red liquid food coloring to the candy mixture. Stir to combine. The amount of food coloring depends on the color lava you want. Leave the mixture for to cool for up to 2 minutes. Pour the mixture onto the prepared cookie sheets. Use random patterns to pour it, creating swirls or jagged shapes. Once the candy lava cools completely, between 1 to 2 hours, remove it from the foil-lined sheets. Press the lava into the top and sides of the prepared cake to replicate lava. 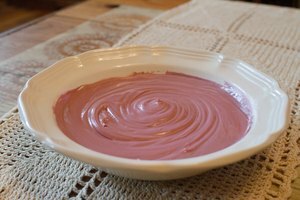 Mix white canned frosting with 5 to 7 drops red food color. Stir to combine. Add more color for a deeper red. Spoon the red frosting into a pastry bag with a star decorating tip. 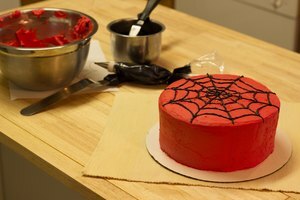 Pipe the red frosting onto the sides of the cake to create the look of lava. Insert a disposable cup into the hole carved into the top of the volcano cake. Add 1 tbsp. baking soda and 3 drops red food coloring to the disposable cup. Mix the baking soda and food color with 2 tbsp. water. Stir until the baking soda dissolves. Right before serving, pour 2 tbsp. white distilled vinegar into the cup. The mixture causes a chemical reaction resulting in a baking soda and vinegar explosion that will bubble up and run down the sides of the cake. The baking soda and vinegar may leave a residue on the outside of the cake, which will affect the flavor. To avoid this, cover the cake in fondant after frosting it. Then, remove the fondant layer before eating.